I’m not a big fan of walks in the rain, but I do like a good pina colada. In fact it was the very first cocktail I tried thanks to my Dad – he had a theory that if you give your kids a tiny bit of alcohol from a young age they’re less likely to be lightweights as you’ll have built up their tolerance for alcohol slowly over the years. I don’t think said theory has any scientific backing, although it certainly meant that booze never really became a ‘thing’ for me – I’ve never been a binge drinker, even at university, and these days nine times out of ten I’ll pick a smoothie over a sauvignon blanc. I do think it says something though about that way of parenting whereby if you don’t make a big deal out of certain foods or drinks and you don’t label them a ‘treat’ or ‘out of bounds’ your children are less likely to rebel and overindulge in them once they’ve left the nest. I think at least that’s how Mr H and I will try to be with our kids when they come along, but we’ll see. I remember tasting my first pina colada and thinking that it was delicious but that it would have probably tasted better WITHOUT the alcohol in. I think I’m in the minority as I’m still of that opinion twenty something years later, but that’s just me I suppose! 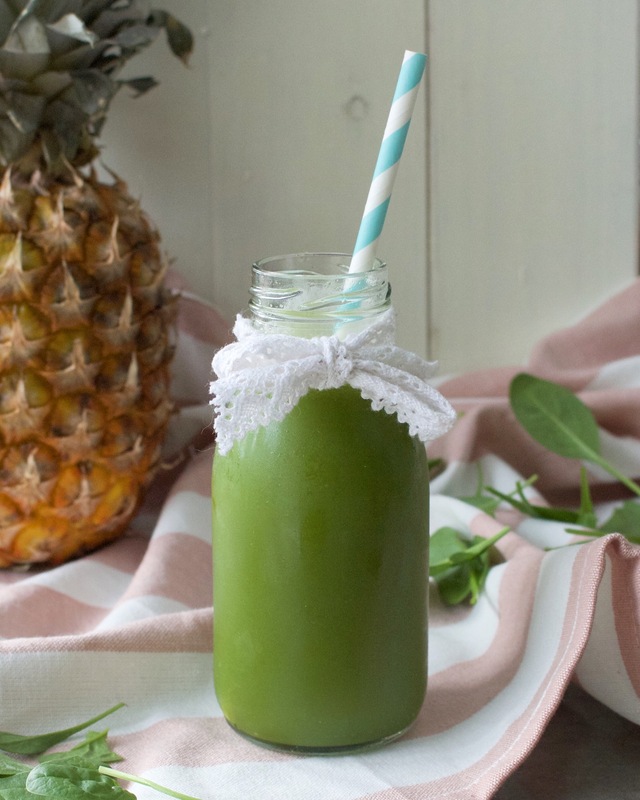 Recently I was in a cocktail bar for a friends birthday and on perusing the menu I had a little spark of inspiration and realised it would be so easy to make a healthy pina colada at home (alcohol optional). 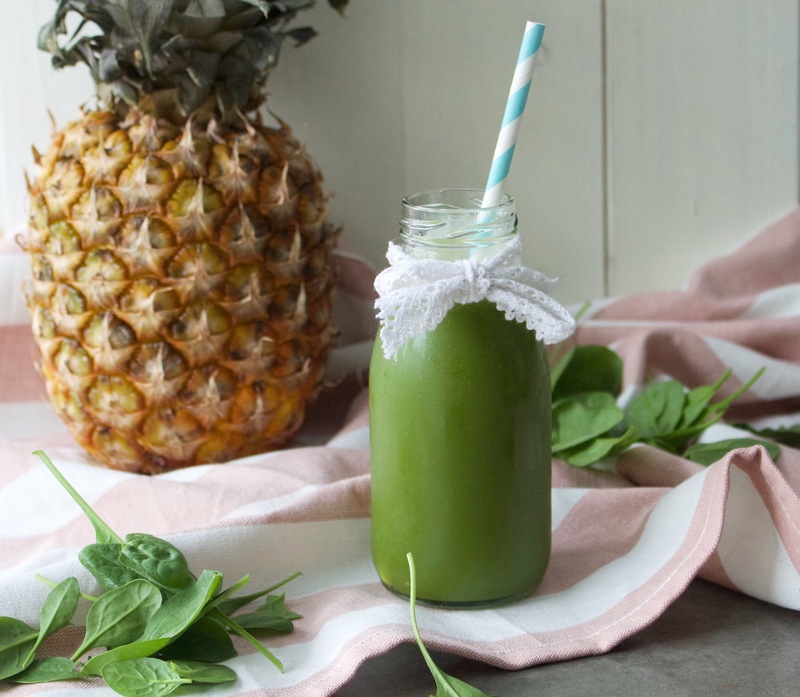 It’s such a perfect summer drink and instantly gives you that holiday feeling as well as being packed with lovely vitamins and minerals, so it’s a bit of an all-round win really! I added spinach and spirulina for an extra health kick and then was delighted with myself when I realised I had the perfect pun in regards to this cocktail’s name. So go on, have a greena colada (and add a little bit of rum in there too if you fancy it). 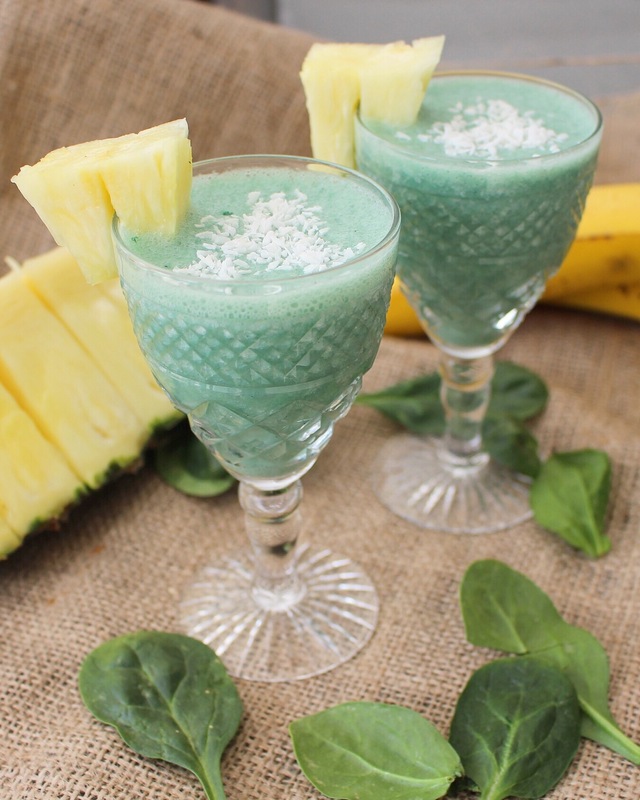 Simply pop all the ingredients into a blender and whizz until all lovely and smooth. Now get out your bikini and enjoy!